All that changed 2 weeks ago; I’d had a really good beginners crochet class at the Wool Haven on the Saturday morning and was feeling upbeat and enthusiastic. I knew we didn’t have anything planned as a family for that afternoon and that I had the time to “play.” My residential care craft class was already planned and prepared for so I was free to do something just for me. To be honest I was sick of feeling guilty every time I saw the loom in its box. From reading up on it I was aware that when new it came with the warp threads already set up. The loom I bought appeared to still have the original threads with about 6 inches of weaving completed. I wasn’t quite sure how old my loom and it’s yarn was but I have the feeling it was at least 20 years old (suspected it could be much older) and to be honest it smelt a little fusty. So first things first I removed the piece already in situ and gave it a wipe down. The picture below is side on to how it would be used. 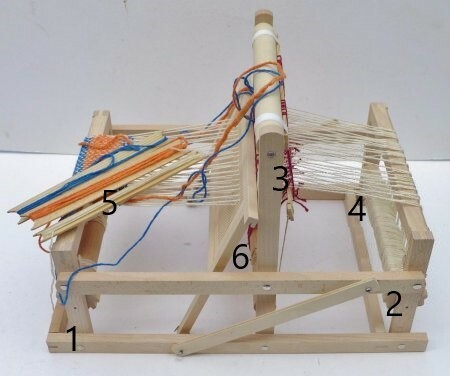 The cloth roller (1) would be at the front, the warp roller (2) at the back. As weaving progresses the fabric is rolled onto the fabric roller and more warp threads let out. The loom is a double heddle, which means there are two separate sets of warp thread holders (the red threads to the left and right of the central post. The warp threads are passed through these alternately through either the front or rear set. As the heddle bar moves forwards one set of threads are raised and then the other half when it is moved backwards. This gives a space for the shuttles carrying the weft thread to pass through without having to weave up and down. But that’s the easy bit and I’m getting ahead of myself. The first job was to cut, thread and secure the warp threads. Of course being sensible I picked a practical length for my first attempt. Oh no, I did the other thing. I cut lengths long enough to make a scarf. Threading the warp threads through alternate heddles is quite easy, it was trickier through the slots in the beater. The instructions recommended using 4 ply cotton, so I used DMC Petra 3 in shade 5712. The difficult bit was making sure the threads didn’t get tangled up but with help from in turn both my husband and daughter I finally get there. I think it took a couple of hours to get that completed but I can say it was a huge learning exercise, mainly because I think I made every mistake possible. Looking at the picture now I can see that I needed to have the threads laid out more even. Once that was completed it was down to the actual weaving. I used Stylecraft Special DK Sunshine and Mocha which I had left over from the Solar System Cal. This went much smoother, it was quite simple to get into a rhythm of heddle bar, shuttle, and beater. The knack is to make sure the weft threads are neither too tight or too loose. I’m not up to counting threads yet so I counted how many times I wrapped the yarn around the shuttles to give me an idea of how wide the stripes would be. There’s still some variation depending on how firm I used the beater. I was on my second day of weaving and made about 10 inches of fabric when I found some of the warp threads were loose in comparison to others. This made it difficult to pass the shuttle as it would catch on the slack threads. At this point I thought it easier to remove the piece and start again. It wasn’t perfect but I was very happy with it for a first try. Next job was to straighten the warp threads, so I could start again. I felt more confident on this second attempt. It may not be a professional fix but it worked and I was able to complete the piece. So ta-dah. I made my first woven scarf. A little short but I’ve got the basics and I thoroughly enjoyed it. Next I plan to get a couple more simple scarfs worked, experimenting with different yarns, see how they look. The loom can only manage a 6 inch width, but there’s plenty I can do with that, scarves, belts, small bags.